If you're into analog, you really ought to be into tape. It's not that analog tape machines (necessarily) sound better than turntables, but rather that the tapes you can get these days sound so much better than the LPs that it's not even funny. Ever heard the term "master tape"? Well, these days you can get one-off masters or one-off from the one-off. The result? Wow. Dynamics. Breathtaking realism. None of the compression that plagues "modern" recordings. No arbitrarily bizarre remixing, remastering, or other shenanigans. Just the way it was meant to be ... but I wax poetic. But speaking of tape, Jonathan Horwich of International Phonograph is an excellent case in point. Jonathan was showing off some of his collection on a United Home Audio Phase 11 tape deck, played back on Jolida electroics, MBL loudspeakers (with some help from Anthony Gallo subwoofers) and Mapleshade wires. Oh, and several hundred pounds of Mapleshade air-dried maple racks, blocks, and big brass footers. The clarity of Jonathan’s recordings is other-worldly — this is frighteningly good stuff. Check out his catalog — but be warned, tapes cost $150 each. 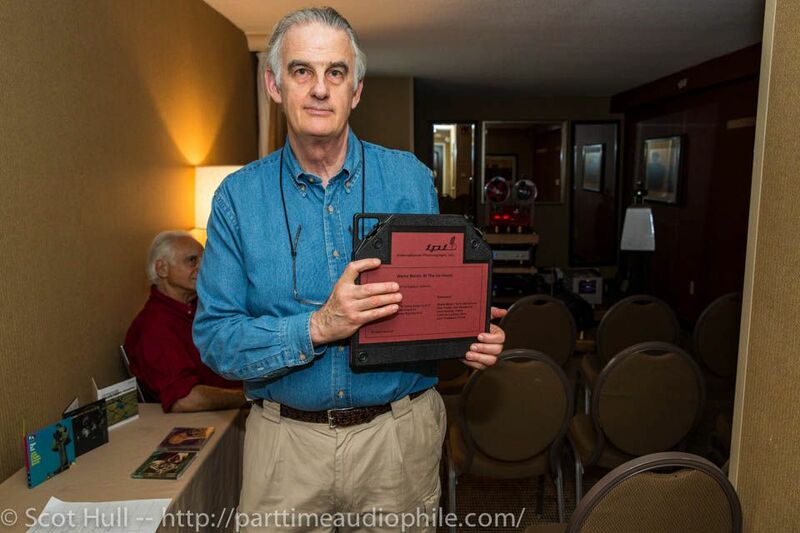 Mapleshade’s Pierre Sprey was on hand, chatting up the crowd about his company’s audio products, including some new triangular “diffusion” tools. For whatever it’s worth, I do think all the wood is a great idea, especially when we’re talking about carpet being the alternative. That said, you do need to make sure the tweeters on the loudspeakers are at ear-level (if that’s how the speaker was designed), so don’t go nuts without compensating accordingly. Liking the picks of all the young people. Hopefully they will grow up with an appetite for fine audio gear. No, you’re right. There’s compression, and then there’s “strangling the last living breath from the music until it’s beating heart bursts out of the chest like that thing from Alien”. That latter bit is not so good.